“There’s something about the Brazilian people that they open the doors to all foreigners and always have an attitude of solidarity. There’s a lot of pain in leaving so many friends behind. We will leave a piece of our hearts here,” said Yulianela González on Saturday before taking a plane to Cuba. González is one of the 202 Cuban health professionals who worked for Brazil’s Mais Médicos – or More Doctors – program and took the first flight back home from São Paulo after the Caribbean island’s government decided to sever its cooperation agreement with the South American country, following “deprecating” and “threatening” remarks made by president-elect Jair Bolsonaro. The More Doctors program was first established in 2013 by then president Dilma Rousseff to tackle the lack of health professionals in poor and remote areas of the country, entering into cooperation agreements with foreign countries, including Cuba, to take doctors to areas where Brazilian health professionals wouldn’t go. 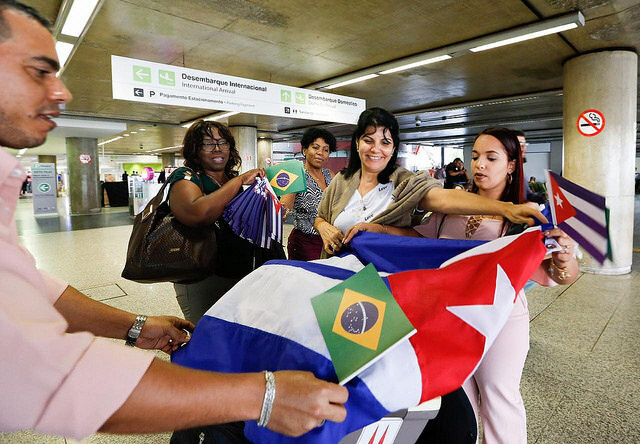 Brasil de Fato covered the departure of Cuban doctors in the São Paulo-Guarulhos International Airport on Saturday, Nov. 24. Cuba’s government decided to end its participation in the More Doctors program on Nov. 14, after Brazil’s president-elect Jair Bolsonaro made threatening statements claiming he would make changes to the Brazil-Cuba cooperation agreement. After the decision, Cuban doctors started to leave the South American country on Nov. 22, at first from Brasília. From across Brazil, 8,471 Cuban doctors are expected to leave by Dec. 12. In São Paulo state, where more than 1,400 doctors were part of the More Doctors program, there are flights taking off to Cuba since Saturday through Monday, taking the health workers back to their home country. González has worked in a local health facility in the city of São Carlos for one and a half year. “We did a lot of work, including education and health, with talks and all kinds of activities. I am very, very grateful to the entire team I worked with, and also the people,” the doctor said. Doctor Yuri Pozo Lago came to Brazil a year and a half ago with his wife, Lianette Rafael, who’s also a doctor and member of the More Doctors program. The couple worked in the city of Santa Cruz das Palmeiras and said they felt “at home” there. “All of us, Cuban doctors, came here with a signed contract, all of us agreed with the conditions to take part in the program. No one was forced to come, we all came of our own free will. We don’t feel enslaved. This money they claim to go to the ‘dictatorship’ is basically going to health and education services for our people,” Rafael said. “We believe we are making our contribution to help our country to keep growing and improving the level of our professionals,” Lago said. The More Doctors program serves more than 3,600 cities all over Brazil, especially in remote and poor areas. For more than 700 of them, it was the first time a health worker was allocated to the area. The Cuban president, Miguel Díaz-Canel Bermúdez, welcomed the first 200 doctors that landed last Friday. “You come back as more than doctors, because not only did you save lives in Brazil, you alleviated the pain of the souls of a people in need, giving love, affection, and medical care,” Díaz-Canel said at the José Martí International Airport in Havana. In five years since the More Doctors program started, more than 20,000 Cuban health professionals came to Brazil to work, 76.3 percent of which were women. When the Cuban government decided to sever the cooperation agreement with Brazil, 8,471 health professionals from the island were working in the South American country, 66.2 percent of which were women. Hey Buddy!, I found this information for you: "Thousands of Cuban doctors to leave Brazil after “threatening” remarks by Bolsonaro". 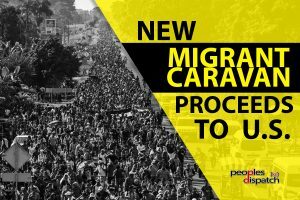 Here is the website link: https://peoplesdispatch.org/2018/11/28/thousands-of-cuban-doctors-to-leave-brazil-after-threatening-remarks-by-bolsonaro/. Thank you.